Odell Beckham Jr.s long-term contract status with the New York Giants is still a cloudy situation. The total value of the deal that he signed as a rookie in 2014 ($10,406,198) doesnt even rank among the top 55 NFL wide receivers. Beckham Jr. will be an unrestricted free agent in 2019, so the Giants’ frugal and methodical front office isn’t in a rush to get a new deal done with their star player. Don’t shed any tears for OBJ. It’s not like the blonde bomber needs a Gofundme page started. Hes not hurting for coin. On Tuesday, the flamboyant, freakishly-talented and controversial wide receiver agreed to the most lucrative shoe contract ever for an NFL player as Nike retained the services of the lightening-rod wideout. Beckham, who was a no-show at the Giants OTA on Monday because he was hanging out with his new gal pal Iggy Azalea, reportedly agreed to a five-year deal with the Swoosh, matching Adidas offer that exceeded $29 million, according to Nicekicks.com. Beckhams current deal with Nike expired on May 1, but the All-Pro wideout was still a restricted free agent, allowing the shoe company to match any offer within a 10-day window. ESPN’s Darrell Rove said that the contract could be worth as much as $48 million for eight years if Beckham reaches certain incentive levels. Last month, the Giants picked up his fifth-year option for 2018 that will pay him $8.5 million. For all of his talent, Beckham has been a headache at times for the Giants – from his dropped passes, to his out-of-control battles with cornerbacks, to his jet-setting lifestyle and premature use of social media to highlight his wide receiver crew chilling on a yacht before a crucial playoff loss last season. But Nike is making it hard for the Giants to have any bargaining power with Beckham in future contract negotiations. His pockets are fat regardless of where he ultimately plays. 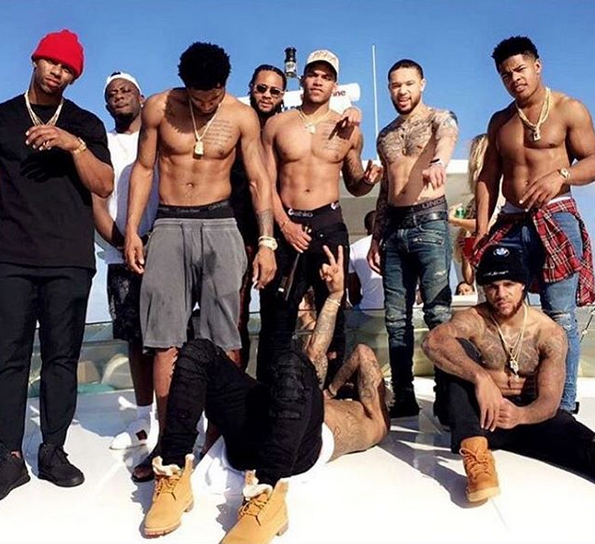 With this newfound pot of gold, don’t expect OBJ to execute any chill. He’s probably going to be more obnoxious, self-absorbed and uncoachable. Exhibiting these crazy behaviors keeps him in the money-driven social media mill and while he hurts his team, corporate vultures pay him for his off-the-wall antics. As great as his numbers are, he still has some work to do before you can label him a leader. Hopefully Beckham Jr.’s performance hasn’t peaked and his aerial production will continue to rise with his celebrity.